Charles Dickens book Mr Pickwick Pages from The Pickwick Papers deluxe signed limited edition book is for sale. Mr Pickwick has been signed by Frank Reynolds the illustrator. 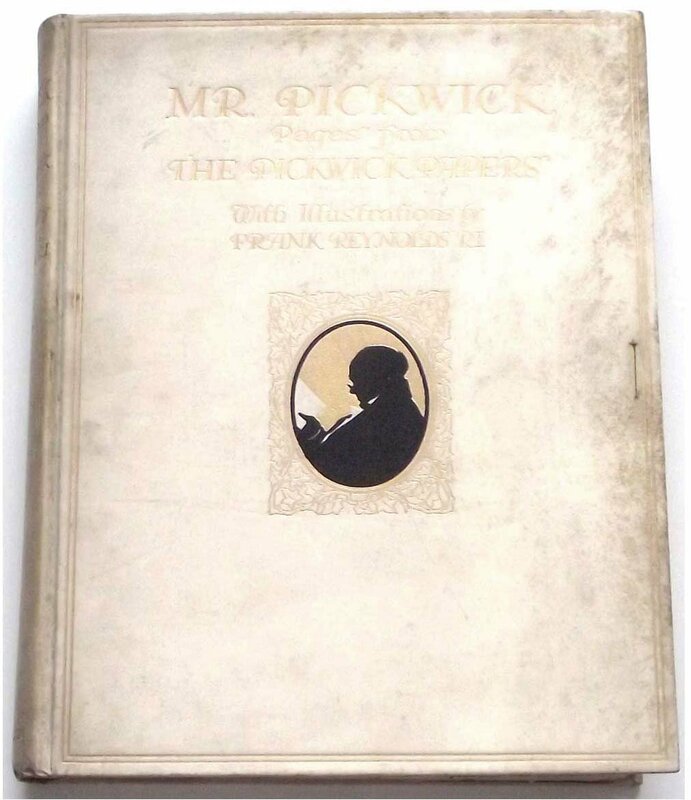 Mr Pickwick is limited in number to just 350 copies worldwide. This is number 254. Mr Pickwick has been illustrated throughout with 25 tipped-in colour plates. The plates are are in Fine condition except one plate opposite page 72 which is in Very Good condition missing the smallest of tips to one corner (bottom left) which affects just the thin margin and not the image. Charles Dickens Mr Pickwick Pages from The Pickwick Papers original white vellum binding bears a gilt and silhouette illustration to the centre of the front board of Mr Pickwick, with the title and lettering also in gilt and surrounded by a two thin gilt lines also in gilt. All gilt decorations and lettering is embossed into the vellum binding. Charles Dickens Mr Pickwick Pages from The Pickwick Papers thick vellum binding measure a very impressive 12.50 x 10.00 inches are in Very Good condition being complete but lacking their ties and having marks, which is consistent with vellum bindings from this period. Charles Dickens Mr Pickwick Pages from The Pickwick Papers has 174 numbered pages, top edge gilt remainder untrimmed, which are in Very Good to Near Fine condition with light browning to the endpapers; a neat inscription to one of the blank pages to the front of the book dated 5th December 1910; and marks to some pages which are small (or in the guttering) and do not detract from the overall attractive appearance of the book.